Controlling of instruments using infrared technology is a good project for Electronics and instrumentation engineering students. In this project a remote has been designed for various home appliances like television, fan, lights, etc. It gives lot of comfort to the user since we can operate it by staying at one place. We can control any of the appliances by using this remote within the range of 400 foots. This project can also be implemented using Bluetooth. You can also Subscribe to FINAL YEAR PROJECT'S by Email for more such projects and seminar. This project consist of two sections, transmitter (remote) and receiver section. Whenever we are pressing any key in the remote it generates the corresponding RF signals, and these signals are received by the receiver unit. 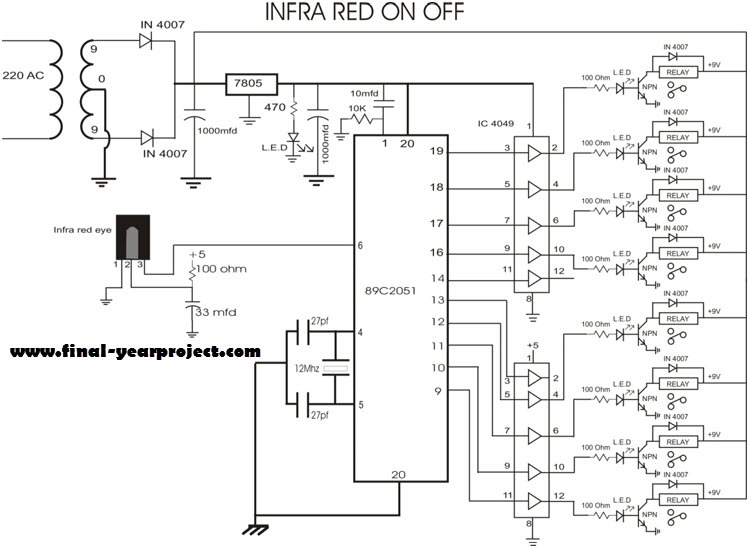 For this purpose we use two microcontroller in this project. 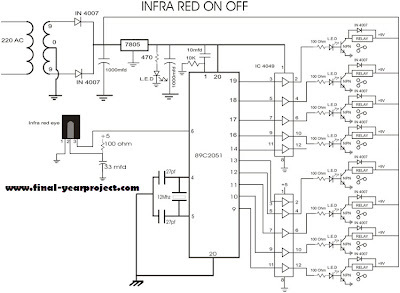 This report includes microcontroller programming, circuit diagram, working of the project etc. Use this report for your reference and study.